My friend Leda is one of the calmest, cleverest and most creative cooks I know. Clearly the chef genes of awesome run strong in her family, because her daughter, Chloe has already proved to be a star sous chef. Who can forget that Maltesers Cheesecake? Leda’s husband, Adam is also a dab hand in the kitchen, the crowd goes wild for his Anchovy Swirls and my godson Jack is showing a budding career as a hand model. 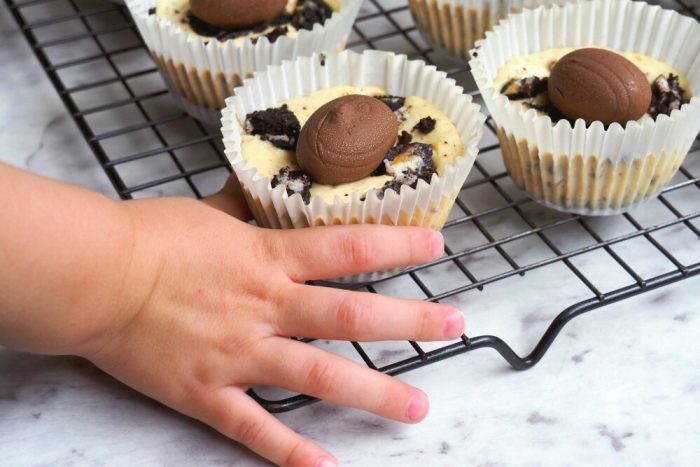 Who can resist those Easter Oreo Mini Cheesecakes? Not Jack, that’s for sure! Anyhoo,if you follow along on social media, you might have seen my new obsession with lunch boxes – they’ve been a game changer in this house, I can tell you. 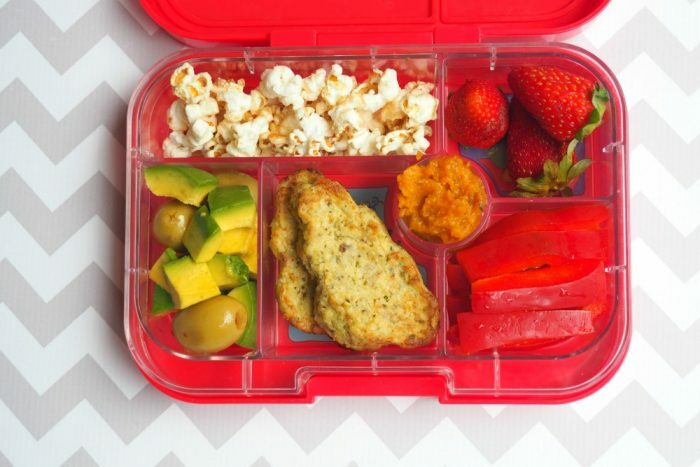 We’re eating more delicious and more nutritionally balanced lunches than ever before. At about the same time as we started packing lunches, Chloe started school and Leda made a spreadsheet of delicious and healthy school lunches. Impressed with, and inspired by Leda, I too have been planning our lunches but not with Excel (because that’s way too techy for me.) I use these yumbox planners because I’m a paper and pen kind of gal. I am usually terrible at texting, I think about my reply 24 times but likely reply 24 hours later, because I always get distracted but on this occasion, I replied immediately, begging for the recipe because I needed this cauliflower goodness in my life, and more specifically, in our lunch boxes. Of course, I had to add pesto because I love it so, but if you don’t have any to hand, stick to Leda’s original recipe and chuck in a few herbs (and spices, if you fancy) instead. As you can see between us Leda and I have an impressive selection of cutters. 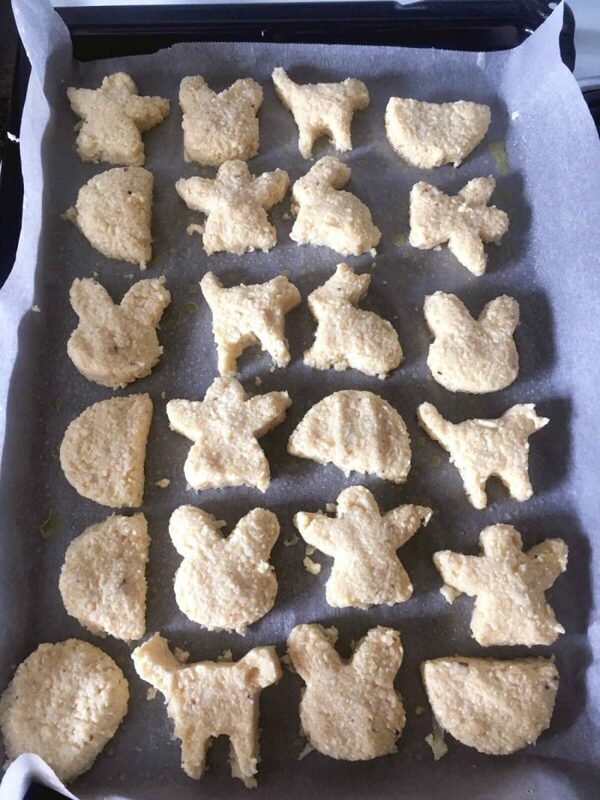 If you don’t share our obsession for cookie cutter collecting or like your food in any given shape, you can shape them into nuggets/bites with your hands. 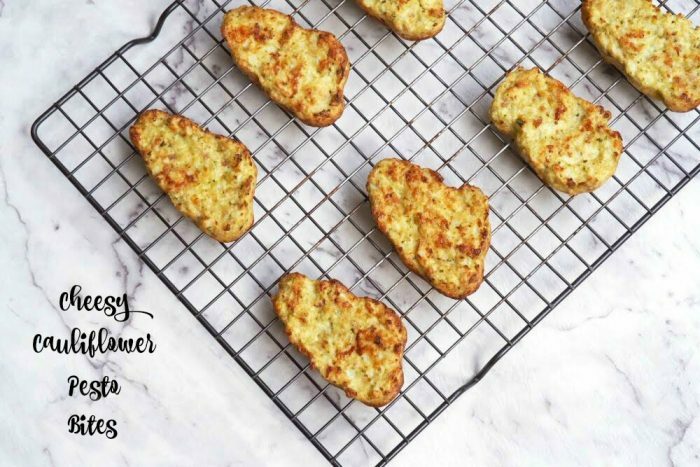 I like alliteration so I think Cauliflower Clouds has a rather nice ring to it, don’t you? Cauliflower is a nutritional hero being an excellent source of vitamin C, high in fibre and contains folate and that’s just for starters. If you want to give a value added nutritional boost to your bites, add in your favourite/leftover veggies. Talking of add ins, you can also mix and match the cheese; halloumi, feta and chilli cheese! The possibilities are endless. These bites pass the ultimate taste test, the kidlets gave them the thumbs up, as did my man child. Veggie smuggling has never tasted so good! Preheat oven to 200 C/180C fan-forced. Line 2 baking sheets with baking paper. Steam or microwave the cauliflower until just tender. Drain thoroughly and use paper towel to blot away the excess water. Add the cauliflower, cheese, eggs, breadcrumbs and pesto to the bowl of a food processor. Blitz for about 10 seconds or until the mixture is throughly combined. To make shapes, place cookie cutter on baking tray and drop heaped tablespoons of mixture in to the shape. Spread and level out the mixture with the end of a spoon and carefully lift up the cutter. Repeat with the rest of the mixture. 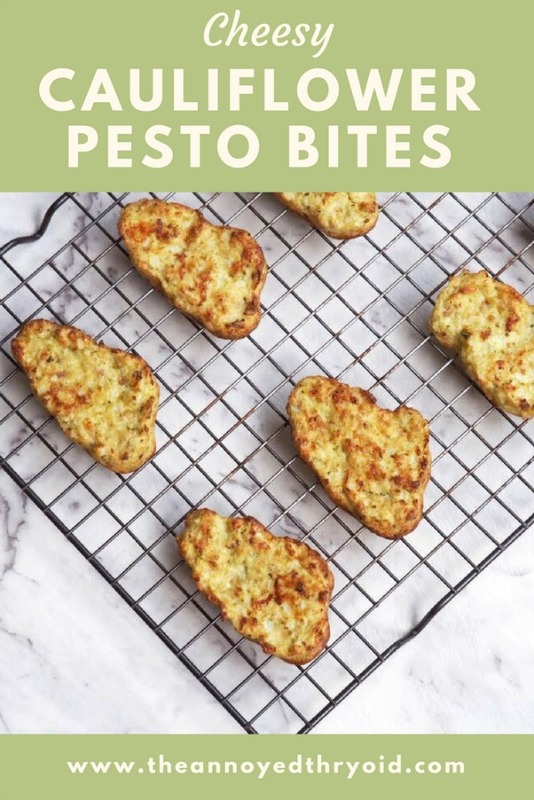 Alternatively shape tablespoons of the mixture into nuggets or bites with your hands. Bake for 15 minutes, turning half way through cooking. The bites are ready when golden and crisp. If making breadcrumbs in the Thermomix, break 1 slice of frozen bread into chunks and chop for 10-15 seconds on speed 8. 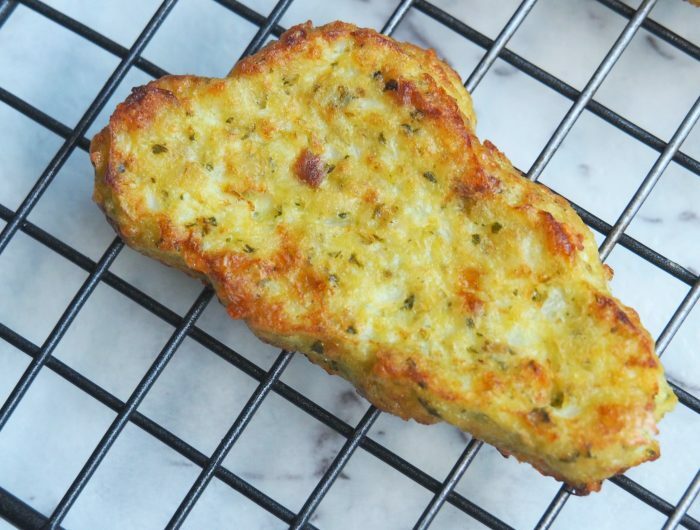 Cut the cheddar into chunks, add to the breadcrumbs and grate for 6 seconds on speed 6. Set aside. Rinse bowl. Add the cauliflower florets to TM bowl and chop for 5- 10 seconds on reverse speed 4. You want the consistency of rice. Transfer the cauliflower ‘rice’ to the steaming basket. Add 700g water to TM bowl, insert the steaming basket and steam for 10 minutes on Varoma speed 2. Carefully insert the spatula onto steaming basket and rest the basket on an angle to drain the cauliflower and allow to cool slightly. Without rinsing the bowl, add the cheddar, crumbs, eggs and pesto. Season well and mix for 10 seconds on reverse speed 4. Bake for 15 minutes, turning half way through cooking. The biites are ready when golden and crisp. TIP: You can freeze the raw or cooked bites in a freezer proof bag or container for up to 2 months. Experiment with different herbs and spices to suit your tastes.